By the Hoary Hosts of Hoggoth! Dr. Strange Hits the Big Screen! – Dork Forty! Home » Movies » By the Hoary Hosts of Hoggoth! Dr. Strange Hits the Big Screen! By the Hoary Hosts of Hoggoth! Dr. Strange Hits the Big Screen! So I went to see the Doctor Strange movie. No, no… Not THAT Doctor Strange movie. I already saw that one, almost 40 years ago. I meant the new one, with Sherlock Holmes in it, and the white lady playing the Asian wise man. So I went to see that. It was a little weird for me, seeing a Marvel movie. I’ve outlined my reasons for not watching their films before (long story short: I don’t like how they treated Jack Kirby). But now they’ve finally made a flick that actually doesn’t have a single thing in it created by Kirby. Amazing, I know. But it’s true. Dr. 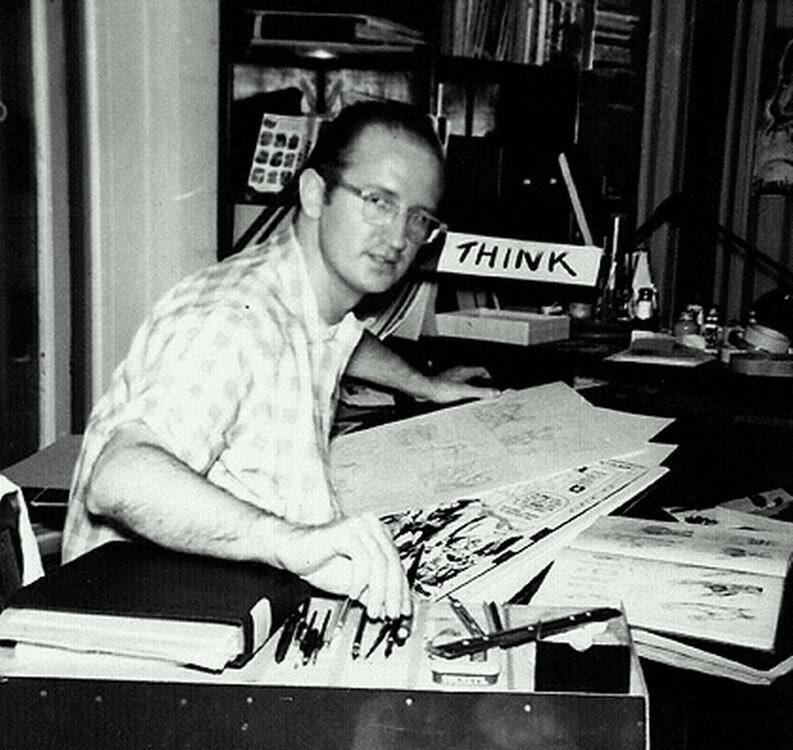 Strange was created by the other artistic titan of Silver Age Marvel: Steve Ditko. Marvel always played pretty fair with Ditko, as far as I know (or at least no less fair than they did with anyone else). And Dr. Strange is one of my all-time favorite funnybook characters, besides. So while I don’t really feel like I’ve missed any cinematic masterpieces by skipping the Marvel movies, I figured I might as well give it a shot. And that decision mostly paid off. This flick’s not any kind of cinematic masterpiece either, but it is an entertaining take on the character that in many ways feels true to Ditko’s original vision. But now I suppose I should talk a little about what that vision was, and how the movie honors it. For one thing, they get the origin very right. In the beginning, Stephen Strange is an arrogant prick. A surgeon more concerned with his career than he is in actually helping people. 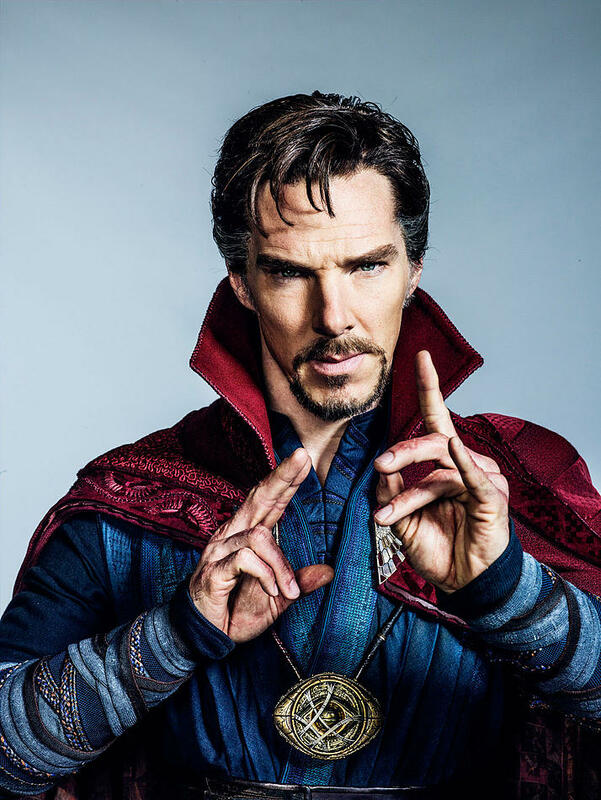 Benedict Cumberbatch excels at playing that kind of arrogance, and he really is great as the pre-magical Strange, coming off like a less likable cross between Hugh Laurie’s Dr. House and Robert Downey Jr’s Tony Stark. Granted, there is good in him. He values human life above even his own glory, rushing to operate on an emergency patient when it becomes apparent his skills are needed to save the man’s life. But he loses those skills in a car accident that ruins his hands beyond the ability of Western medicine to heal them. And so in desperation, he seeks the aid of Eastern mysticism. …a great scene that leads to what’s easily the best sequence in the film. She sends Strange off on a positively psychedelic tour of other dimensions, a visual feast that has to be seen to be believed. There’s a bit with him falling into his own eyeball that I especially liked. But since I couldn’t find a picture of that, you’ll have to settle for this. It’s one of the least-trippy things in the sequence, but it still manages to capture the feel somewhat. …the Inception stuff still feels a bit uninspired. That’s okay, though. 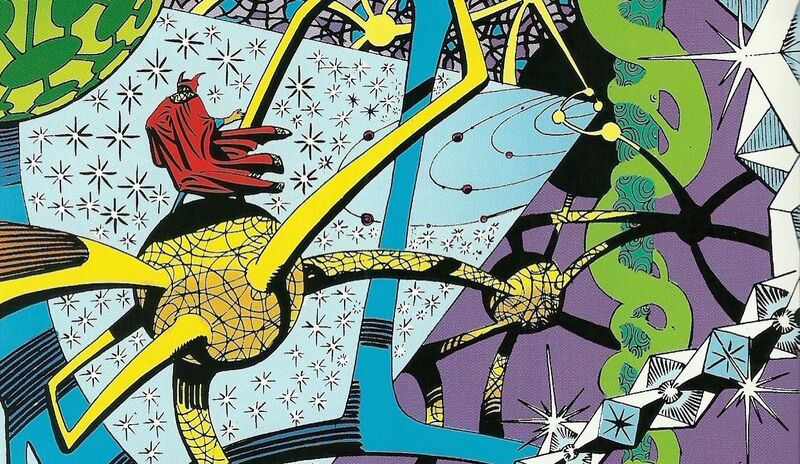 Strange’s tour of the multiverse is super-trippy, and when we get to see the Dark Dimension, realm of the Dread Dormammu, it’s based very heavily on illustrations like the one above. It’s exactly the sort of visual I was afraid they’d shy away from, but instead they really go for it, rendering the Dark Dimension as a series of floating spheres connected by long curving rods, all of it floating in weird purplish space. Their depiction is more concrete, more… visceral, I suppose, than Ditko’s airier, less representational style. But they make that work in their favor. The whole thing looks like some kind of cancerous molecular model, a nice touch considering the medical themes running through the film, and the growing, devouring nature of the Dark Dimension itself. Anyway. I’m getting ahead of myself. The Dark Dimension is actually more of a background element for most of the film. 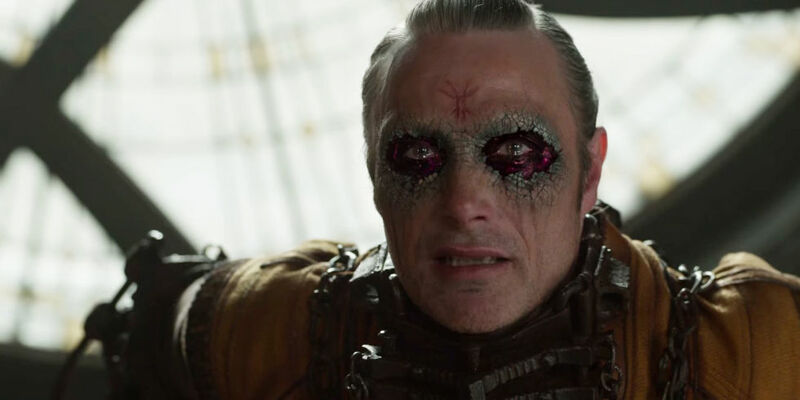 The villain here isn’t Dormammu, but Kaecilius (Mads Mikkelsen), a former disciple of the Ancient One who’s turned to Dormammu worship. That’s a major departure from the comics, where Kaecilius is just a flunky of Baron Mordo. 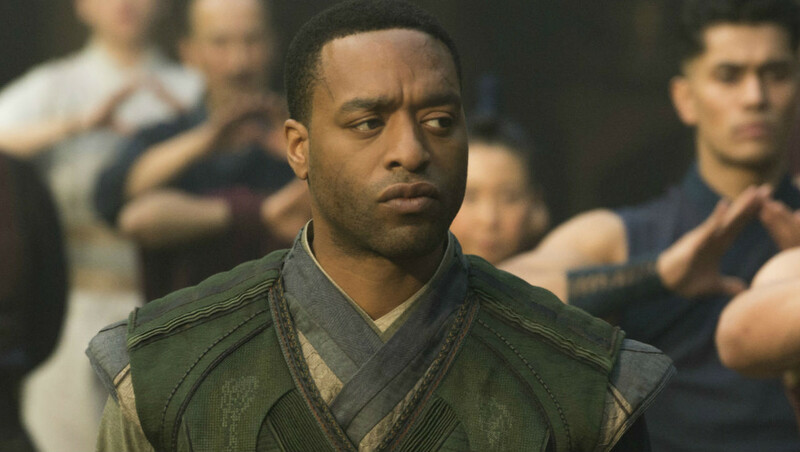 Here, though, he takes Mordo’s place as the disciple turned bad, while Mordo (played with great intensity by Chiwetel Ejiofor) is the Ancient One’s most devoted student. 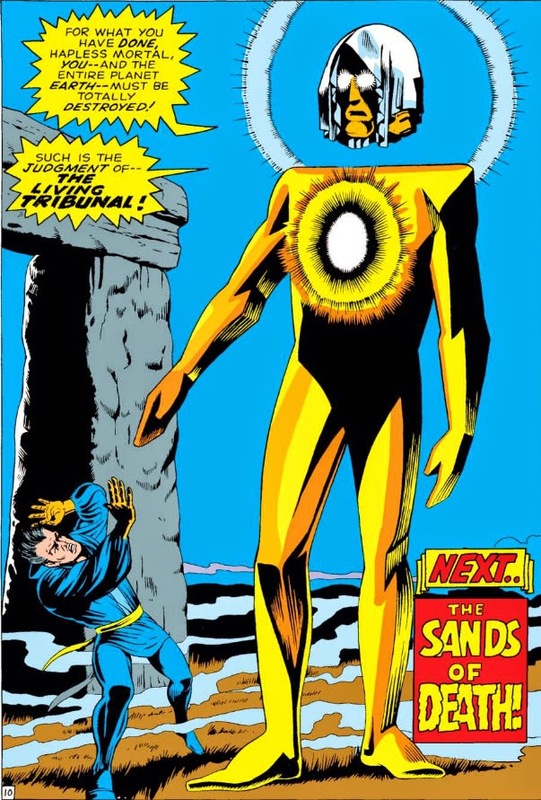 But instead of being motivated by the simple greed and jealousy that drove funnybook Mordo to the dark side, Kaecilius turns to Dormammu for the best of reasons: he’s come to believe that the timeless nature of the Dark Dimension will end death, granting eternal life to everyone on Earth. He believes this, in part, because of secrets the Ancient One has kept from even her closest disciples, secrets that tempt Strange and threaten to shatter Mordo’s faith. So this first Doctor Strange movie is basically about a magical schism, a philosophical break between the Sorcerer Supreme and her pupils. I like that. It gives everyone involved more depth, and makes the magical world of the characters richer. I’m less enthralled with some of the nuts and bolts of how magic works in this film. I’m especially not excited about the concept of “sling rings,” which are sort of magical brass knuckles that allow sorcerers to cast spells. I assume that they wanted to give Strange a classic super hero Achilles Heel, a weakness that makes him vulnerable: take away his ring, and he can’t do magic. But it seems kind of artificial to me. Tacked on. Plus, the design of the things would make it impossible to do some of the more complicated spell-casting hand gestures that Ditko’s Strange was noted for. I was also, at first, not terribly excited about the “kung fu sorcery” approach they’ve taken to magic, with fights between sorcerers looking a bit like something out of a wuxia flick. They jump around and do martial arts, with most of their spells used to either conjure up glowing magic weapons, or to create the Inception effects, which shift gravity and make their opponents jump around even more. Of course, I love wuxia movies, so this approach grew on me as the movie went on. I do miss the more formal mystical battles of the old Dr. 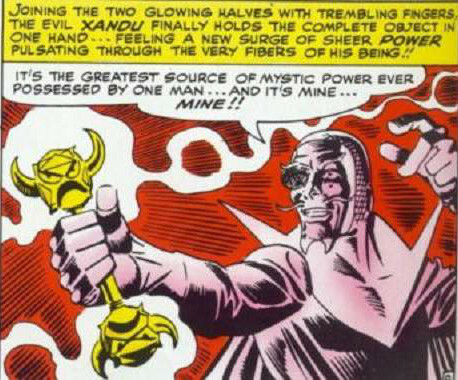 Strange comics, with their crazy shouted spell names and bizarre, more unpredictable effects. Here, the magic all starts to feel the same after a while. But it does have the benefit of being kinetic, and a lot of fun to watch, besides. So ultimately, I’m okay with it. This is a fun film in general, though, a well-constructed pulpy ride that entertains while never quite insulting your intelligence. Granted, the script isn’t very deep. So that conflict between the Ancient One and her students doesn’t have the bite it could have. Mads Mikkelsen seems especially wasted here. His beef with the Ancient One falls flat because he’s so obviously wrong about how Dormammu operates. So his character’s a bit of a cardboard cutout, when he could have been a compellingly complex villain. The guy who gets the most mileage out of the schism, though, is Chiwetel Ejiofor, who depicts Mordo with surprising nuance. They take a slow burn approach, starting him off as a sort of big brother figure to Strange, showing Our Hero the ropes while also being developed as a fanatically-devoted disciple who’s kind, but capable of brutality. Then he gradually loses faith as the rules he’s been taught to live by are broken, first by the Ancient One and then by Strange himself, all in the name of the greater good. If you came into the film not knowing anything about the character, you might not guess that he was going to turn bad. And (SPOILER), but I’m not sure “bad” is really what happens to Mordo. It’s more that he’s rigid and judgmental, and his disillusionment leads him to not just turn his back on Our Heroes, but to decide that they’re an abomination against natural law. Appropriate for a guy whose primary weapon is called The Staff of the Living Tribunal. …as well as a few other magical artifacts from the comics whose names I don’t really remember. The most prominent of these, of course, is Strange’s Cloak of Levitation (and I quite like how they use that). But mostly, it’s Easter Eggs done in the name of the fan service that Marvel Studios has so famously used to win over the Fanboy Nation. Not that there’s anything wrong with that.